advertising chromolithographic print Au Bon Marché, Maison A. Boucicaut. First lesson on baking and... on strategic marketing! 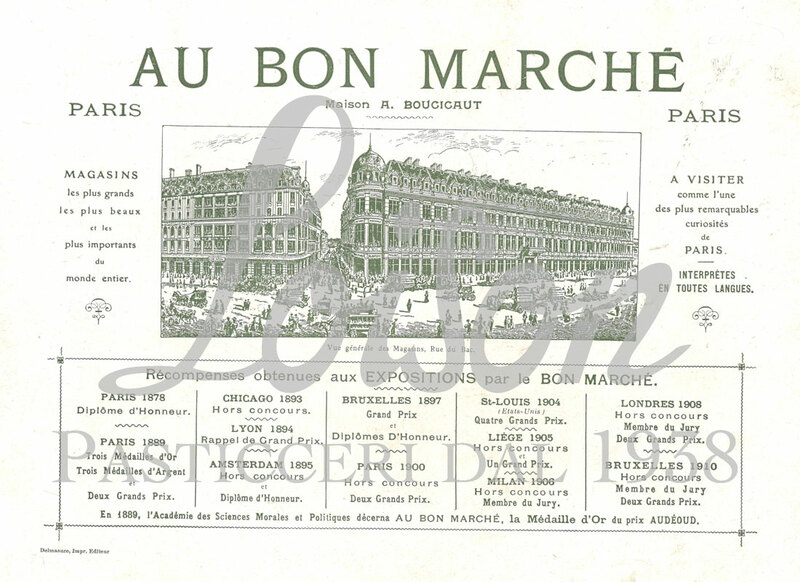 It was 1852 when Au Bon Marché, the first ever modern department store, opened in Paris. The creator was Aristide Boucicaut, a textile merchant who started his career as a street vendor and would soon revolutionize sales strategies and women’s shopping experience. His department store did in fact cater primarily to the universe of women, whose psychology Boucicaut understood too well. For the first time, anyone could pop in and stay for as long as one wanted, browsing through merchandise laid out on the counters, each piece bearing a descriptive label and the price. Frenchwomen could thus freely give in to all their frivolity, changing style every season and matching their chosen garments with accessories of their liking. A flock of attendants was ready to meet the ladies’ every vice and whim. For the bored husbands in tow, there were tea parlors and large sitting rooms where they could patiently wait for their wives to finish shopping. A special space was reserved for the children, who could entertain themselves with rocking horses and toys. Boucicaut’s own foresight became the foundations of strategic marketing theories today: home delivery with “money back guarantee”, mail-in orders, distribution of catalogs, promotions and, last but not least, marked-downs twice a year. Talk about innovation! And what about our chromolithographic print? What does it have to do with Au Bon Marché? This too was a brilliant idea from Boucicaut who, in 1865 – that is 13 years after the opening of his stores – had found a way to build customer loyalty. He thought of giving his customers a small gift in the form of a card with images. This promotional tool gradually helped him increase sales. Every Thursday afternoon, Boucicaut would stand just outside the entrance to his department store and hand out to every child a colorful print with the promise that there would be a new one if the child came back the following week. In those days, children did not go to school on Thursdays and, in this way, he ensured that mothers had no excuses to use against the demands of their children. Boucicaut entrusted professional designers with the task of creating vignettes on cards of different formats, featuring 6 to 8 chromolithographic figurines. This is how the advertising medium was born: on the front, there were images of thematic scenes, while the back was reserved for advertising, sales and promotions, or for the list of awards received at trade fairs. The chromolithographic print owned by our Museum is perfectly intact and still bears bright colors. On the front, there is a young teacher during her first pastry-making lesson with girl students. 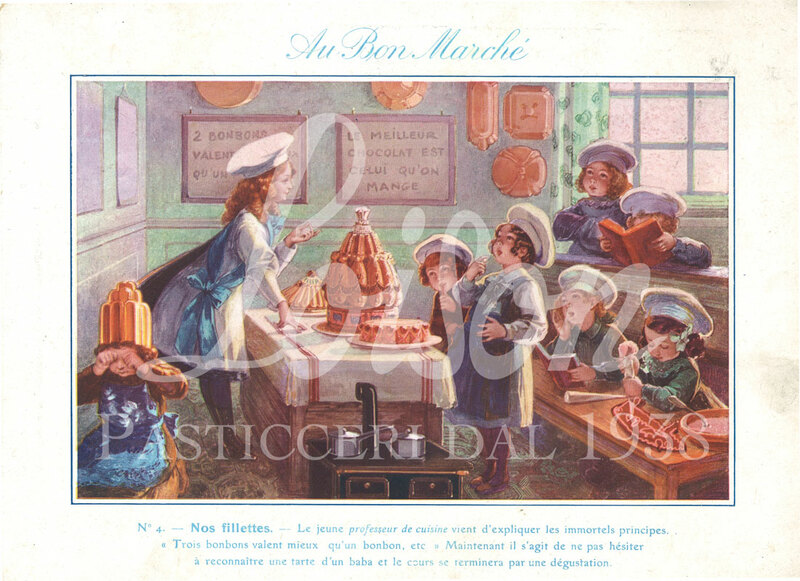 At the desks, six girls donning a Toque Blanche listen intently to their teacher and cannot take their eyes off the table laden with the most tempting delicacies. Standing in front of them are three scrumptious cakes: on the right a charlotte, in the center a tiered gateau most likely consisting of layered cakes artistically decorated on all sides, and on the right another charlotte. A couple of the pupils have their nose in a manual, while another girl experiments with decorating techniques. In one corner, there is a child sitting on the floor and rubbing her eyes. She is wearing a huge copper mold on her head. Could it be that she got in trouble? On the walls are “maxims” that no skilled pastry chef should ever forget: “Two candies are better than one” and “The best chocolate is that which we eat”. How can we blame them? And how did the lesson end? On a sweet note, of course!